AFRICANGOBE – The Tamenhint airbase 30 kilometres north-east of Sebha is reported to be back in pro-Gaddafi hands after Toubou forces from Murzuk who were guarding it withdrew. They unilaterally pulled out yesterday evening claiming that the government was deliberately exploiting clashes in Sebha between the African Tebus and Arab Awlad Sulaiman in order to divert attention from moves to replace it with a new administration. It has not been possible to confirm the allegations. The airbase was first seized on Saturday by pro-Qaddafi elements but they then withdrew by evening as government forces led by the Murzuk unit approached. “Ali Zeidan is the one who contributed the worsening situation in the south in an attempt to divert attention,” the head of Murzuk Military Council, Colonel Barka Warduko, told the Libya Herald today. He said he had withdrawn all his troops from the base. Warduko accused the Prime Minister of increasing tensions in the south – at Sebha, the airbase and the Sarir oilfield – in an attempt to undermine calls for his removal on the basis that with the country’s security under threat Libya could not afford a change in government. He said that Zeidan was being deliberately partial, supporting one group and neglecting others. He claimed that the situation in the south, particularly the animosity between the Tebus and the Awlad Sulaiman, was getting worse despite the best efforts of various mediators to promote reconciliation. Warduko appeared, however, not to be overly concerned that his decision to withdraw from the airbase had allowed pro-Qaddafi an opening. He said that forces from Misrata were on their way to ensure law and order in the area. Misratan forces headed south on Saturday, following a meeting in Misrata between Defence Minister Abdullah Al-Thinni and Misrata Local Council and other Misratan officials, but they went to Jufra rather than Sebha. Forces from Zintan are also expected to head towards Sebha to help secure the area. Clashes have continued in the southern regional capital. It was reported this afternoon to be quieter than yesterday but that overnight clashes had resulted in three dead and nine wounded being taken to the medical centre. 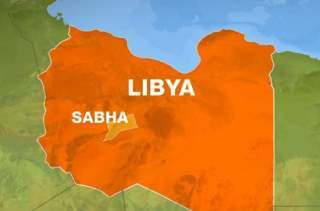 Shops and business remain shut, according to the Libyan news agency LANA. Meanwhile yesterday, the National Security Directorate in Sebha warned that the lack of human and financial resources from the authorities was exacerbating the crisis in the area. At a meeting yesterday, it said that it was trying its best to maintain security but that it lacked the wherewithal to ensure the safety of banks, businesses and other institutions and maintain law and order on the streets.